Hello! We love to share our opinion now and then and today’s post is about those little spots in which we love to take pictures. There are several places that we had to leave off of this list because it wouldn’t be a top 5 if we didn’t. First of all, don’t feel bummed if your resort or venue is not on this list. This isn’t about the 5 prettiest spots. It’s about those 5 places in which the light is always great, the decor helps a lot, and/or we have a few palm trees that make the lighting so-much-better and our life easier while photographing the bride and groom. This little gem is our top pick for photography. It’s just perfect. There are no tourists walking around, nobody is in the background for us to photoshop later on, and the palm trees on the left side just makes this spot perfect for bride & groom photos with soft lighting. – It’s intimate and secluded. – Both full sun and shaded areas in the same spot. – Perfect place for the bride to walk down the aisle without tourists in the background. – It can feel unbearably warm during the day, especially if the ceremony starts a little later than expected. – The areas that we love to photograph in can look a little “messy” to most people. They look great in photos. I’m sure we expressed a million times how much we love this venue. Everything from the staff, the planner -Janelkis, who’s THE MOST helpful and easygoing person to work with-, to the little details is perfect. It feels less rushed than most other venues which makes our job easier and better overall. The lighting is fantastic, the backgrounds are great for photos, and the venue itself is beautiful to be included in many of our backgrounds. – It’s intimate. Especially if you choose a weekday to get married over there. – It’s beautiful. The decor, the venue, the palm trees scattered around the beach areas. – It’s simple. 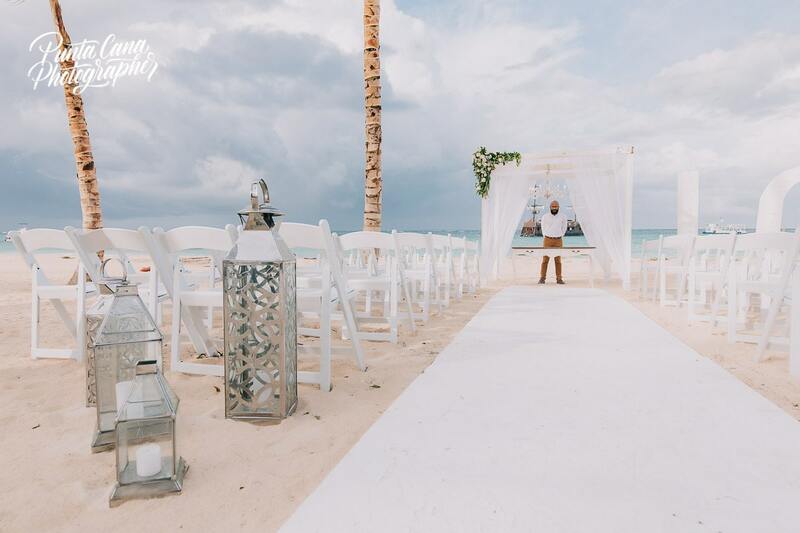 Getting married at a resort will simplify many aspects of your wedding day, but getting married at a venue like Jellyfish will make all those details so-much-better. – The officiant. Jehison is our top pick in Punta Cana, without hesitation. – Did I mention the food? It’s great. – The access to the venue is really bad (As of January 2019, while the area is still under construction). – There are some constructions in the area that doesn’t affect our photos, but can be seen in person, especially when driving towards the venue. This will all be solved in the short future when the construction process finishes. I don’t think words can describe this place. It’s simply perfect. The views are the best, the lighting is just beautiful, and the location of the gazebo is simply fantastic. Being in La Romana instead of Punta Cana, you’d get the sunset right over the ocean, which means sunset photos right after the ceremony. How does that sound? – Well, pretty much everything. The light, especially the light. – There are shaded areas around the gazebo in which your guests can wait until the ceremony starts. – You can plan your cocktail hour and reception in the same spot, so neither you or your guests have to walk around the resort. – The light from the sun reflecting the ocean can be blinding at your ceremony time for your guests. Since the sun sets over the ocean, an hour or two before sunset the reflection from the water is very bright at times. – If the resort planned more than one wedding for the day, the next wedding might take place at the “Beach Gazebo” which is quite close to this one. You can ask Hilton’s staff about other weddings on your same date to solve this issue. 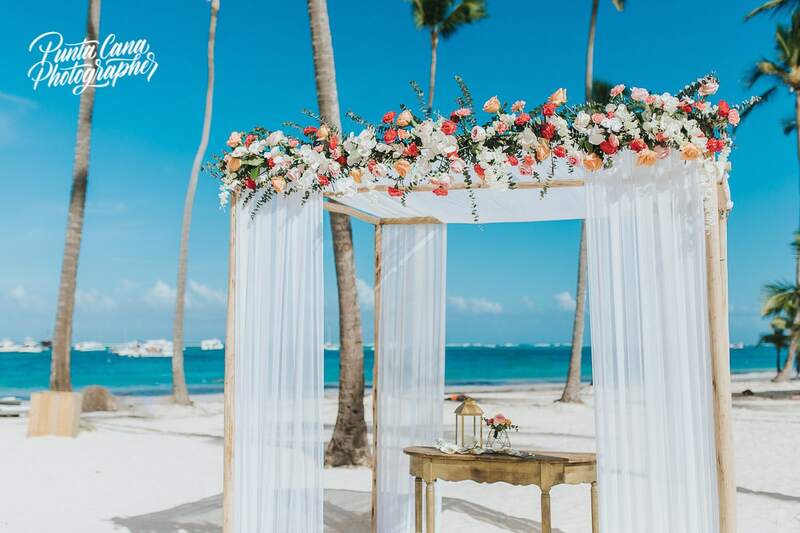 There’s a reason why many of our brides chose this spot over any others while planning their wedding in Punta Cana. The decor is simply stunning, the planning is well taken care of by Mayte and her staff, and the place simply runs like a clock. Service is excellent, times and schedules are followed to the tiniest bit, and the venue is gorgeous. – The staff. The service. The planning. It just works. – It feels intimate as the restaurant is closed to you and your guests. – You won’t run into any other guests, brides, or whoever you might run into in an All Inclusive resort. It’s private. – Do you care about service? Top-notch. 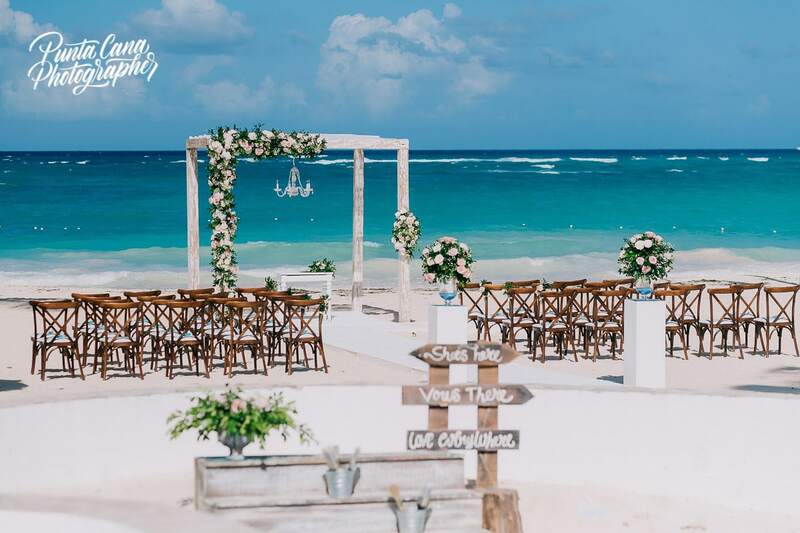 – The weddings take place right in front of the ocean. This is fantastic and probably the main reason you’re getting married in Punta Cana. The downside of this is that if you’re that kind of person that worries about everything, you will see people walking at the beach. This isn’t a problem for photos so it shouldn’t be a problem for you. – The sun sets behind the venue, so it’s a little trickier to get Sunset photos, but when the weather helps those are gorgeous towards the left side of the ocean. There are a few reasons Huracan Cafe couldn’t be left off this list, the main one being the staff. They take care of everything so neatly that the planning process should be a breeze. Nati and her team do wonders and they deserve to be here because of that. The venue is located right in front of the ocean, with its pros and cons, and it’s simply beautiful. The layout, the palm trees, the decor. It’s all great. – The bridal suite has plenty of natural light, which makes for awesome portraits during the getting ready and right before the ceremony. – The place feels rustic but with a touch of modern and the decor plays a big role in this. – This stretch of beach is wide enough to walk around and take pictures with a few different backgrounds. – Being right in front of the ocean, its biggest downside is the people walking around the area. It’s not a problem for photos, but they tend to stop and stare at the beautiful decor & events. – There are a few excursions that take place near the venue and now and then we get big boats and people around. This happens in most outside venues, and honestly, it’s not a deal breaker (it shouldn’t be). This top 5 list is concluded with a few special mentions. We cannot include every single place we love because the list would be endless and we noticed that most couples don’t want to read endless posts (we work hard on those wedding planning guides). – Catalonia Royal Bavaro has a little place in our photographic hearts. The open areas are just stunning. – We absolutely LOVE the beach at Pearl Beach Club. It’s unique and perfect in it’s own way. – Sanctuary by Playa has its unique beauty. You have to see it to understand. – Secrets CapCana would be one of the places we’d definitely love to spend more time at. – Nati, a local planner, has been working hard on a beautiful venue called Chateau CapCana. You should keep an eye on it too. – Flor de Cabrera, quite far from Punta Cana, also deserves a mention as one of the best places we had the chance to work at. We’re thrilled to be shooting 2 more weddings there in the upcoming months.